You are browsing the internet, as usual. All of a sudden you come across a news article that talks about governments snooping on the citizens of their countries/states. You check and double check whether this news report has anything to do with you? Once you find that the article talks about some other country that has a robust security mechanism in place where almost all public places are being monitored by law enforcement agencies round the clock, throughout the year. This gives you a craving to check out your favourite movie download site or probably imdb to check out sci-fi movies revolving around the theme. You find movies like Eagle Eye, that has an artificial intelligence based system developed for US military that is supposed to track down and take care of terrorist activities around the world autonomously, but then the system somehow finds human beings being incapable of taking the best decision and takes the matter in it's own hands. There are a lot of other sci-fi movies that have taken this idea of artificial intelligence and government sponsored surveillence to a new level and while the central idea of these movies was not really this AI or surveillence, but a good amount of possibilities revolving around the idea of AI systems going haywire and surveillence systems going in the wrong hands. Movies like those in the famous Transformers franchise, or the ones in the Fast and Furious franchise, particularly Furious 7 that talks about an imaginary surveillence program called God's Eye that can find anyone on the earth using a variety of tricks law enforcement agencies actually use in real life. You find the idea interesting, and the movies too have show the idea larger than life. You download a few of these movies, spend some quality time watching these movies on your home theatre setup o a lazy sunday afternoon, and then reach out to your smartphone to update your facebook status! Okay, so what's the big deal about this idea, you think. Just to remind you of the depth of the idea of snooping, I would like you to recall the NSA contractor Edward Snowden and Wikileaks, and what all was released in the public domain about the activities of the security agencies of the United States of America! Okay, what's big about that? This relates to governments of different countries snooping and collecting intelligence secretly about each other, you crib. The matter settles down. You forget the idea of snooping and secret surveillence being done over you in the daily chores of your busy life. Then one fine day, while browsing the internet, you come across another article, in some tech magazine that talks about something that relates directly to you. This in particular, is related to your gadgets, that you so fondly carry with you, all the time, in particular that android smartphone that is one of the most pampered gadgets you have. It gets to travel in one of your pockets most of the times, and stays closer to you than any of your gadgets. Through that article, you come across this link. If you are logged in to your google account on the device you click the link on, I believe you are going to be stunned at what you will see (given that you are among the majority of technically not that sound population, or are not an insider, or a tech blogger, blogging on the very topic of security). In case you still haven't felt the curiosity to check out that link, I will tell you, you will get to see a Google map showing some red dots, a lot in case of frequent travellers. What are these, you ask? Stupid, this is all the details of which all places you have travelled to with your darling android smartphone, and you so fondly updated your facebook status telling your friends and not-so-friends about your whereabouts. One thing that you probably didn't know about was the fact that everytime you turn on internet on your smartphone, because of one small permission that is recommended, and worded so cleverly that possibly dupes the user into believing that this permission is for something that will help you, and indeed it will help you. 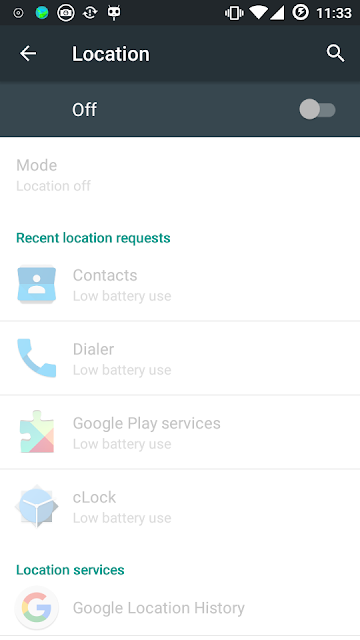 This smartly devised permission request will also mean that most of the users coming through this small harmless looking permission asked by your smartphone will accept to allow the smartphone to track the smartphone's location. You don't care what all data is being collected and where all that data will be used and where is it all accessible and how to get the same removed in case you want to. Then curiosity kicks in and you click one of the numerous red dots on that map. And bang! You get a more detailed view of your visit to this particular place, along with the date and time you visited there, the time you spent at this place and the route you took going to and coming back to and from this place. This is unbelievable, you think, and then you start clicking the other dots to find out that all your visits have been recorded by Google! Not to say that Google will use this for anything wrong, but the possibility is still there. What if a data like this falls in the wrong hands, afterall no organization is unpenetrable, the NSA of the USA as well wasn't! Just the places I visited with my android smartphone, with the location history on. Ever since I realized that late last year, I keep it off on my smartphone. This is when you realize how sinister this could be. Just one small permission on your smarphone resulted in so much data being captured about you. This is akin to a stalker stalking you, keeping a check on what all places you go, what all times you go to at these places, what are the routes you travel by. And this is when you realize how the Google Now App used to surprise you with the notifications at about the time you usually left for office, also showing the route that you usually took to office and the traffic information and alternative routes to your office. There are ways out too, here. 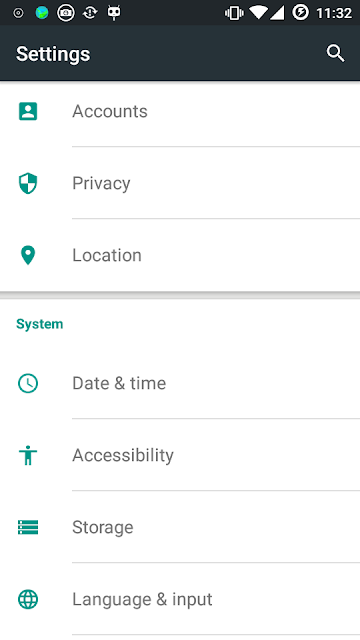 Google does give you option to tell them not to record your location history, and also give you option to delete all the data is already has about the places you visited, by visiting the above link I shared. 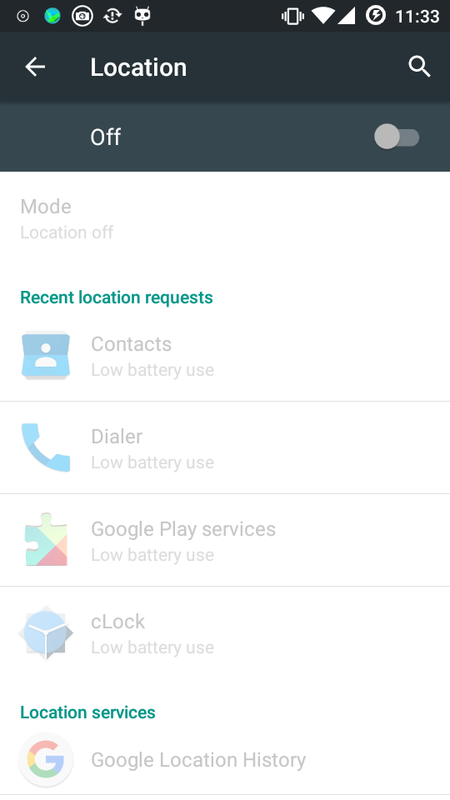 To do that on your smartphone, just go in Settings, > Location, and turn off the top option, which must have been on, passing on all the details of your whereabouts. To make this happen on your browser, be logged in your google account, and then visit this link. At the bottom of the page, You could see Location History is on, and a button to Pause location history. This is not to say that Google will not keep a track of your location, as it has still got a variety of ways to do that, one of them is your search using the Google search engine, and other is the browser on your computer, one of them has the Google trademark too! Keep your eyes and ears open, I will be back again, with more conspiracy theories!